Killer 9.0 copy with fresh off-white/white paper. Still one of the most undervalued of the early Silver Age Marvel keys. A dynamic comic with nice centering (PERFECT cover alignment however), sharp corners, bright colors and MILK WHITE PAGES. It is a structurally no doubt about it 9.4 (just take a look) so this is a very harsh grade. 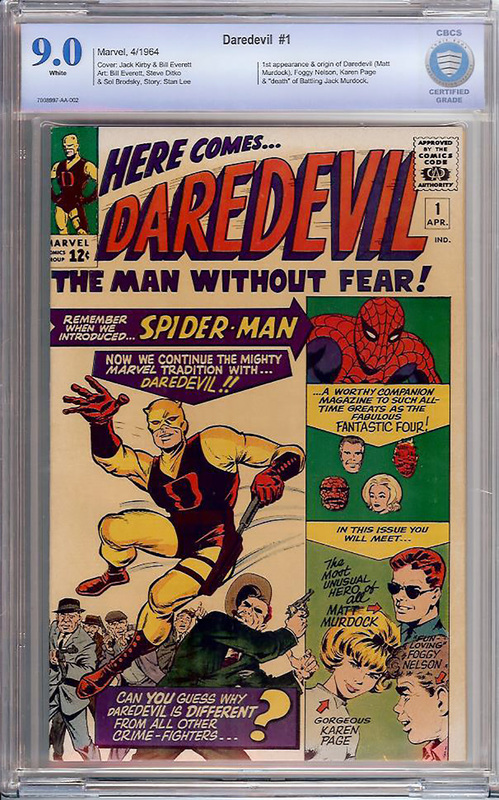 Features the first ever appearance of Daredevil with his fantastic origin included. From the incredible high grade Silver Age Marvel collection of Alex Almaraz (name and address stamp appears on the back cover similar to all the books from his amazing Silver Age collection)! One of the most sought after SA keys right now. The last 9.0 offered for sale went for $13,200 just recently, in August, 2018, constituting a new record price for a 9.0. In fact, each new high grade sales seems to be a record one. Talk about a hot book, folks.